GolfBuddy Platinum II is an example of how a great Golf GPS device should look like and function. It is equipped with all the necessary features that define a GPS device, and it is also very easy to use. Although just like most other devices it has a few shortcomings but they are not major issues, and so you can easily overcome them. All in all, it’s an excellent device and any golfer will benefit a lot from using it. GolfBuddy Platinum II is an improvement of the World Platinum, and it seems to have made up for the few shortcomings in the previous device. However, the most notable improvements in the Platinum II are the high contrast screen, improved sensitivity of the screen and a high-performance battery that can now last up to 18 hours. The design has also been improved significantly, and the device now looks more elegant. The technology used in the device remains the same, but things seem to work much better than in the previous devices. With the Golf Buddy Platinum II, you will benefit from a better-performing golf GPS that is also easier to set up and use. Shot Tracking: Golfers can be able to track location and distance of each shot thanks to this feature. Online Portal: Players can review their statistics on the app or log in to the GolfBuddy website. Scores and Statistics: Golf Buddy Platinum II tracks scores for up to four players and provides statistics and analysis for the GPS owner. Auto-Advance: It has an auto hole recognition and an advanced feature that automatically moves to the next hole when playing. Screen: Platinum II has a three-inch touchscreen that is also trans-reflective. The color TFT LCD screen is glove-friendly meaning you can still use it even when wearing gloves. Buttons: Since most of the functions are accessed sing the touchscreen this GPS has only three buttons for On/Off and access to Quick Tools and ProPlay. Course Availability: This GPS boasts over 33,000 worldwide courses, and this makes it one of the devices with the most pre-loaded golf courses currently on the market. There are also no fees for future course addition and updates. Dimensions and weight: The dimensions for this GPS are 2.46 x 4.3 x 1 inches, and it weighs 5.65 oz with the battery. Resistance: The GPS has been designed to be shock and water resistance making it possible to use it in any weather conditions. The biggest benefit that you will get from using this device is that you will have better control of different aspects of your game. Being able to track shots and having a statistics to review later one will have a significant impact on your game since you will know the areas you need to improve. Another benefit is that this device will give your access to thousands of golf course from across the world and so you will find all your favorite ones here. With Golf Buddy Platinum II you get full hole graphics which is quite a unique feature and very helpful in a game. Shock and water resistance makes it more durable and also means you can use it in wet conditions. Has exceptional course coverage and it is hard not to find your course no matter where you are. Golf Buddy Platinum II has a better touch screen than its predecessors, but it still needs some improvement to make it more sensitive. It has some mapping errors and lacks important hazard pre-mapping. 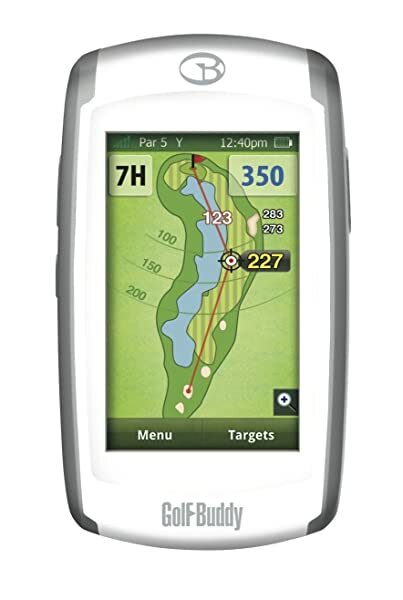 Golf Buddy Platinum II is an example of how a best Golf GPS device should look like and function. It is equipped with all the necessary features that define a GPS device, and it is also very easy to use. Although just like most other devices it has a few shortcomings but they are not major issues, and so you can easily overcome them. All in all, it’s an excellent device and any golfer will benefit a lot from using it.